WASHINGTON (Sputnik) - The United States has spoken with both Chinese and Russian officials and warned them that the Venezuelan National Assembly is the only entity allowed to provide for the issuance of new debt in Venezuela, a senior administration official said in a press briefing on Monday. "We have had fairly pointed discussions with the People’s Republic of China on not throwing good money after bad, and we cautioned them that the United States, the Lima Group of nations and others, that made abundantly clear that the only, under the Venezuelan constitution, the only entity which is lawfully authorized to allow or to provide for the issuance of new debt is the National Assembly. We’ve had a similar discussion with Russia," the official told reporters. This warning comes as US President Donald Trump issues a new executive order that bans Venezuelan officials from selling public assets at low prices in order to get themselves kickbacks, as well as bans US citizens from all transactions related to the debt of the Venezuelan government. Earlier on Monday, US Secretary of State Mike Pompeo issued a statement condemning Sunday's election and vowing to take economic and diplomatic actions against Venezuela. 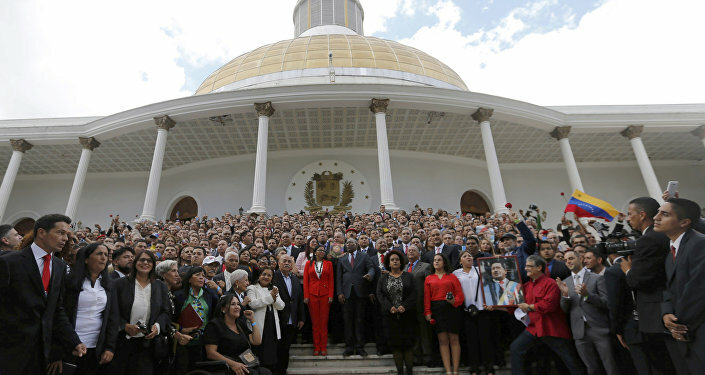 The National Electoral Council in Venezuela certified Maduro's re-election with 68 percent of the vote. The election took place amid a financial crisis in Venezuela whose economy has been hit by falling oil prices. Venezuela also experienced mass protests last year, which initially were organized in response to the highest court's decision to significantly limit the parliament's legislative powers.